Every work area needs a desk. Some would prefer to buy a “regular” desk, which usually comes in a rectangular shape. There’s nothing wrong with this choice if you are planning to use such kind of desk in the middle of the room. However, if you're placing it next to a wall, then you could be making a mistake. The area above the desk is a wall space that you could use for storage, placing decors or for other purposes. Since you are not using it, it’s a space that is going to waste. Of course, you have the option of installing a hanging cabinet. However, that would also mean more purchases along with the inconvenience of the installation process. Thankfully, there’s an easier way, and that’s with the use of a computer desk with hutch. A computer hutch desk works just like any other desk except it comes with an “extension” on top of the work surface. You can use the top area for a plethora of purposes from adding decorations to organizing documents. In this article, you’ll find a compilation of some of the best computer desks with hutches in the market right now. Also, the article includes a buying guide to ensure that you get the one that is an excellent fit for your situation. With an appealing wood grain finish, this computer hutch desk radiates with classiness and sophistication. It's a desk that can work well within a home or office setting. The desk features two USB drives and two electric outlets. This allows you to power your devices conveniently without the need to do gymnastics around the desk. This computer desk with hutch features three drawers for organization and storage purposes. One drawer is big enough to store folders conveniently. The drawer glide is made from metal, which allows it to be more durable. With a ball bearing for the glide mechanism, it's smooth and effortless to operate. 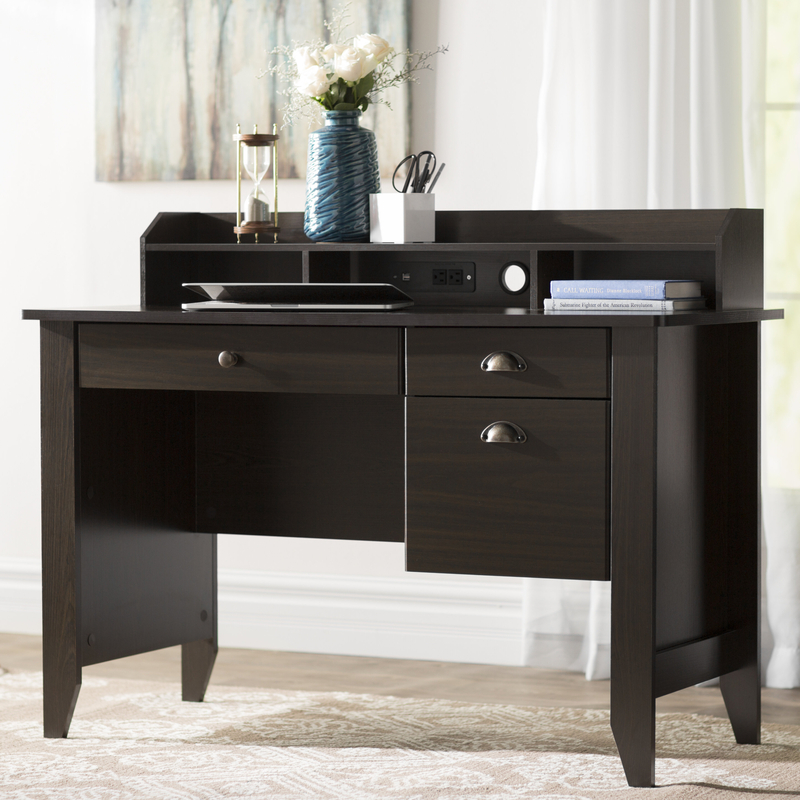 Crafted from oak wood laminate, the desk features a good balance between price and durability. This is a computer hutch desk with a clean look and efficient use of space. The main desk offers ample area for a monitor and other additions such as a clock, pen box, and even a small potted plant. The hutch area features a small gap that makes the desk more stylish. However, the gap is not only for aesthetic purposes as it's primarily designed for easy management of device cables. The desk also features a retractable layer designed for keyboard and mouse. The lower right panel of the desk features a drawer and a space big enough for a CPU unit. If your device doesn't need a CPU unit, then you have the option of placing a shelf for more storage space. If you want a computer hutch desk that looks "grand," then this one may be the right one for you. With a 58-inch width, 25-inch depth and 64 and a half an inch height, it can readily become one of the highlights of any room. This computer hutch desk features a cottage oak finish and gives off a vibe of coziness and warmth. It’s complimented with black-colored hardware that enhances the durability while completing the stylish look at the same time. This desk is crafted from solid oak wood. Because of such, you can expect it to be more durable compared to units made from manufactured wood. Aside from the main desk, the unit features two shelves and eight drawers. You'll hardly run out of storage space when using this unit. This one is designed to maximize corner space. Despite being a specialized desk, it doesn't fall short when it comes to the aesthetics. The desk features a heathery gray finish and clean lines. The chrome-finished hardware is the perfect complement to the color and design, enhancing the aesthetic appeal of the desk. The hutch features two large shelves which are an ideal place for books and decor elements. One covered shelf on the middle allows for more style and a bit more of security for the items inside. Also, it comes with four small shelves which are ideal for routers and modems. Since the unit is designed for a corner space, the main desk offers a larger working area compared to the regular computer hutch desk. With an L-shaped configuration, this desk is ideal if you want to maximize that corner space to the fullest. Standing at around 66 inches, 59 inches in length and 59 inches in width, it's one of the biggest L-shape computer hutch desks out there. The hutch features two cabinets on top that allows for easy storage of important documents. There are two large shelves for books, framed pictures, and other decor elements. There are also four small shelves for storage of small items. The desk also features two drawers on the lower area. One is big enough for A4 folders. There's also a retractable space specifically designed for the keyboard and mouse. The overall look features a balanced look between black and the natural colors of wood. It gives off the impression of simple sophistication. The design is versatile enough that it can work in most office settings. A corner L-shaped hutch desk built with affordability in mind. Despite the lack of extra features and fancy additions, this unit is able to cover the essential functions of a computer hutch desk. For one, it's a corner desk which allows you to take advantage of a corner space fully. Consequently, you'll have a lot more desk space compared to your traditional rectangular-shaped desk. It comes with a retractable tray for the keyboard and mouse. The hutch comes with one cabinet for storing items. It also comes with two shelves for books, notes, and other documents. The top area of the hutch is accessible, and you can freely place decorative items or treat it as another shelf space. An imposing computer hutch desk that fits really well with a traditional style setting. The overall design and white color exuberate elegance. This desk comes with a hutch that's unquestionably not a product of a designer that is trying to cut corners. The hutch features three layers of shelving and a total of eleven "boxes" in varying sizes. Another highlight of this product that's worth mentioning is it comes with a matching seat. Most shoppers don't know that finding a seat that will match the desk can be a problematic task. In this case, you can skip this task thanks to a seat that is perfectly crafted to pair with the desk. A computer hutch desk that is ideal if you want something that is economical, offers plenty of room and maximizes the use of corner space. The unit is mostly made of high-density commercial-grade particle board. As a result, the unit is a lot more affordable compared to the solid wood types. The surface material is crafted from high-quality melamine, which makes it resistant to wear, stains, and scratches. The hutch comes with two relatively large cabinets and four paper management shelves. Since the main desk area is L-shape, you have plenty of room for a monitor and other office-related items. There's also a separate tray for the keyboard and mouse. The bottom half of the desk features three drawers. One drawer is specially designed for keeping sensitive documents as it’s secured with a lock and key. In many cases, an L-shaped desk is fixed in a specific position. Hence, if you choose a desk with the hutch that is on the left side of you when facing the monitor, you're stuck in that configuration. With this product, you are free from this limitation since it’s left-facing or right-facing. Aside from being a very versatile product, it also doesn't fall short in the aesthetics department. With a primary color of dark taupe and chrome-colored hardware, you will have no difficulty of fitting it into a home or office setting. The unit is also very generous when it comes to the storage space. It comes with eight drawers and plenty of shelf and desk area to go with it. A computer hutch desk that is not only relatively economical, but it also comes with a very professional look. The product is mainly crafted from heavy-duty manufactured wood panels. While it’s true that manufactured wood tends to be less durable compared to solid wood, this product is loaded with features that are designed to make it tougher. For example, the unit is supported with powder-coated and scratch-resistant steel. Also, the wood is protected with a moisture-resistant PVC laminate. Aside from the durability-related features, the product also comes with ample space for storage, organization and work area. It features four drawers and two platforms. There's a primary desk area for the monitor and other office-related items and decors, and another secondary platform for the keyboard, books, notes and other documents. What Computer Desk with Hutch Should You Get? Finding the right computer desk with hutch is not a difficult task if you know what you are looking for. And yet, a simple as that may sound, it's a bit tricky to do. One reason for this is because most inexperienced shoppers have little information about the critical factors that should be assessed before buying a computer hutch desk. To make things a lot easier, below are some of the most essential points that you need to consider. Most of the products in the list are crafted from wood. Hence, this article is going to focus more on the said material. Not a lot of people know that there are three major categories of wood used for furniture. There are the particleboard, plywood and solid wood. Each of these categories has a significant impact on the cost and durability of the wood. Hence, it's a factor that you should consider carefully. Solid Wood - This means that the wood is cut directly from a larger piece of wood. The advantage of solid wood is that it's the most durable when compared to your other choices. It's also denser, which makes the furniture sturdier. On the other hand, it's a bit challenging to move around because of the weight. Perhaps the biggest downside of solid wood is it's the most expensive option. Particleboard - A type that is composed of sawdust and wood chips that's compressed tightly. The particleboard keeps its shape with the help of a powerful adhesive agent. The particleboard also goes by other names such as manufactured wood and fiberboard. This type of wood has the advantage of being the most economical. On the downside, it's not very durable, and it's very susceptible to moisture and water damage. Plywood - This type of wood is composed of long thin strips of wood that are compressed and glued together. With regards to durability and costs, the plywood sits in between the solid wood and particleboard. This means it's cheaper compared to solid wood and more durable than particleboard. On the other hand, it's not as durable as solid wood and is more expensive than particleboard. Another thing to consider is the type of device you are going to place on the computer desk with hutch. Specifically, are you primarily using a laptop or CPU? The reason behind this is because most computer hutch desks are designed for either a laptop or CPU. If you have a CPU, then you'd want computer hutch desks that have a space for the processing unit. Also, you'd want a desk that has a separate area for the keyboard and mouse as it's the more comfortable setup. If you are mainly using a laptop, then your best choice would be computer hutch desks with a single platform. Buying a desk with a second platform for the keyboard and mouse means you'll be overspending as those units are generally are costlier and you have little use for the extra feature.